Some meeting highlights (Dresden, 4 October 2018): Prof. Bernd Büchner (Scientific Director of the Leibniz Institute for Solid State and Materials Research, IFW Dresden); Winner of the PhD Contest Mariia Terentieva (University of Cambridge, UK); Dr Iryna Tybinka (Minister-Councellor of the Embassy of Ukraine in the Federal Republic of Germany) and Prof. Olga Garaschuk (President of the German-Ukrainian Academic Society) at the Exhibition. Copyright: Jürgen Lösel/ Deutsch-Ukrainische Akademische Gesellschaft e.V. It is often said science knows no borders and international cooperation is an essential element of modern research enterprise. 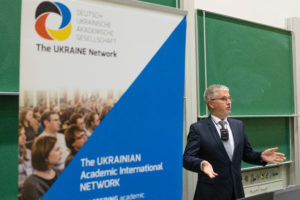 The German-Ukrainian Academic Society has been established in Berlin two years ago as a grass-roots organization of engaged researchers with the main goal of fostering bilateral academic cooperation. Starting with 16 enthusiasts from 10 German cities, the society membership has now almost tripled and its representatives are active in different areas of sciences and humanities in 22 cities both in Germany and in Ukraine. Some 20 researchers gathered in Dresden on the 4-5 of October 2018 for the society’s second annual meeting, organized under the auspices of the Saxon State Ministry for Higher Education, Research and the Arts, to network, exchange ideas and discuss future joint activities. Interested members of local academic community and general public joined in for the public part of this event. At the exhibition preview. Copyright: Jürgen Lösel/ Deutsch-Ukrainische Akademische Gesellschaft e.V. 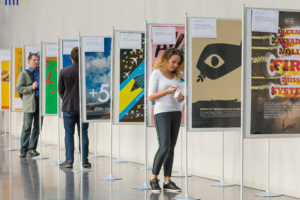 The meeting started with a very special highlight – a preview of the poster exhibition “50 Inventions Bestowed by Ukraine to the World”, kindly provided by the Ukraine Crisis Media Center and supported by the Embassy of Ukraine in the Federal Republic of Germany, which also funded the translation and publishing of the accompanying book. Dr Ronald Werner (Head of the Department of Higher Education Institutions at the Saxon State Ministry for Higher Education, Research and the Arts) welcomed the gathering and stressed the positive role Ukrainian researchers and students play in Saxony. Professor Bernd Büchner (Scientific Director of the Leibniz Institute for Solid State and Materials Research (IFW Dresden)) presented a particularly successful bilateral collaboration between the IFW Dresden and Kyiv Academic University (KAU) and presented the German-Ukrainian Excellence Center entitled “Topological order of electrons in solids: New materials, Phenomena & application Concepts” (UKRATOP). This large-scale collaboration has recently been identified for support as one of two pilot projects supported with €1 million for four years by the German Ministry for Education and Research (BMBF). Moreover, this fruitful partnership ideally complements activities of the IFW Dresden within the Cluster of Excellence ct.qmat, which has just won funding by the German Research Foundation (DFG). Next, Dr Iryna Tybinka (Minister-Counsellor of the Embassy of Ukraine in the Federal Republic of Germany), has extended her welcome to the participants, stressed the importance of Germany as a leading cooperation partner for Ukrainian researchers and officially launched the exhibition. Vitalii Mutsenko at the PhD Contest. Copyright: Jürgen Lösel/ Deutsch-Ukrainische Akademische Gesellschaft e.V. Anna Tyutyunnykova, OncoRay-National Center for Radiation Research in Oncology, Dresden, Germany: “Prostate Cancer: Kills the Enemy with X-rays using its food supply”, the second place. As a part of the reward all the contest finalists were offered an opportunity to take part in an accompanying dedicated intensive CV and grant writing workshop, specially organized by the society for its junior members. In addition, the winners received the monetary award of €300 for the first and €200 for the second place, which has been endowed by Nomad Bioscience GmbH. This highly innovative biotechnology company sponsors this contest from its beginnings. It was founded and is directed by Professor Yury Gleba, member of the Leoplodina and Ukrainian National Academy of Sciences among his many other achievements, and an active member of the Society. Prof. Jochen Fornasier, Dresden, 4 october 2018. Jürgen Lösel/ Deutsch-Ukrainische Akademische Gesellschaft e.V. Another highlight of the meeting was an invited lecture given by Professor Jochen Fornasier (Goethe University Frankfurt/ Main), also a member of the society. He presented remarkable archaeological discoveries he and his team made together with his long-standing colleagues in Ukraine studying antic city of Olbia Pontike in the south of Ukraine. The meeting has been concluded by the Networking Reception. The German-Ukrainian Academic Society is especially grateful to the Extraordinary and Plenipotentiary Ambassador Dr Andriy Melnyk and the Embassy of Ukraine in the Federal Republic of Germany for facilitating and sponsoring the organization of this exhibition, to Professor Gianaurelio Cuniberti (Chair of Materials Science and Nanotechnology, TU Dresden) and Professor Bernd Büchner (Scientific Director of the IFW Dresden) for their immense help in organization of this exhibition and their active support of German-Ukrainian cooperation.